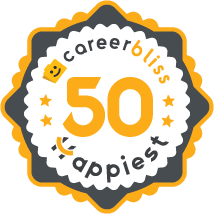 On average, employees at General Electric give their company a 4.0 rating out of 5.0 - which is 5% higher than the average rating for all companies on CareerBliss. The happiest General Electric employees are Consultants submitting an average rating of 5.0 and Equipment Services Project Managers with a rating of 4.9. "Poor management. Lack of communication in the workplace if you are nobody but hourly pay. HR Department do not excite. You need to call the hotline if any questions or complaints." "This review does not necessarily give bad review of GE as a whole but does point out some unfair practices utilized to keep salaried employees in tight corners as a condition of employment. If you go into any management or salaried employment with this company you will be classified as "exempt employee status". After many years I learned what this meant. To the exempts already working at GE and the ones that are pursuing careers with GE, beware of the fine writing when coming on board. Especially the one policy for exempt employees that states if you feel at anytime that you were treated unfairly you must seek justice by their own solutions program. You cannot take GE to court in front of a jury. This you are to sign at the onset of your employment, the rest of you like myself was forced to e-sign it as a condition of continued employment back in 2009. This is why we are always used to pilot their money saving endeavors, and you get treated as a lesser employee compared to the regular employees. Beware, I was dealt a bad hand 2 yrs ago over an innocent issue that was never investigated, and as a dedicated employee for many years, but with health issues that were breaking me down fast, they used a petty incident that was beyond my control to relieve me of my employment with GE. The Rutland VT management lied to corporate and by not being able to litigate in the court system in front of a juror of peers I'm totally destroyed. So beware!!!!" "It's a good place to work. Friendly environment." "Great place to work, and multiple career opportunity to advance"
"I've worked with GE since 2012. GE is a wonderful work place." "I was contracted to work onsite for GE through CompuCom." "I've worked with GE for the past 14 years. Long sales cycles and good environment to build great relationships with your customers. Little room for advancement or changing out of this niche industry once you have started your career here." "Good wages, decent benefits, a good deal of overtime available. It is so large you are just a number. GE is a top down company and it takes forever to make any changes for improvement. They talk safety a lot but it's just that, talk. The supervisors and parts chasers. Most of them have never worked in manufacturing prior to working at GE. On a scale of 1 to 10 I would rate the floor level managers manufacturing knowledge a 3 at best. They have a high turnover of supervisors." "I have worked for GE Osmonics since 2007. This is one of the best companies when it comes to pay rate, holidays, and benefits." "Work culture is very nice. Good to work. Benefits also nice." "I worked as contractor at GE and it is good company to work for. Unfortunately, my contract just ended." "I have worked 3 years for GE. Working for GE is what you would expect. Large company with many opportunities. Work is not too crazy but takes a while to make decent money and to get a decent position." "This was a short 3 month contract position. GE treated the contractors like step-children - scolding them if they made waves (while just trying to move the project forward).I myself was left off the mailing list for all GE correspondences - and this went undetected for a month.A nine month contract was assessed after 3 months and most contractors were laid off due to poor performance. Really this was poorly organized and the results show this. This should have been much better organized."